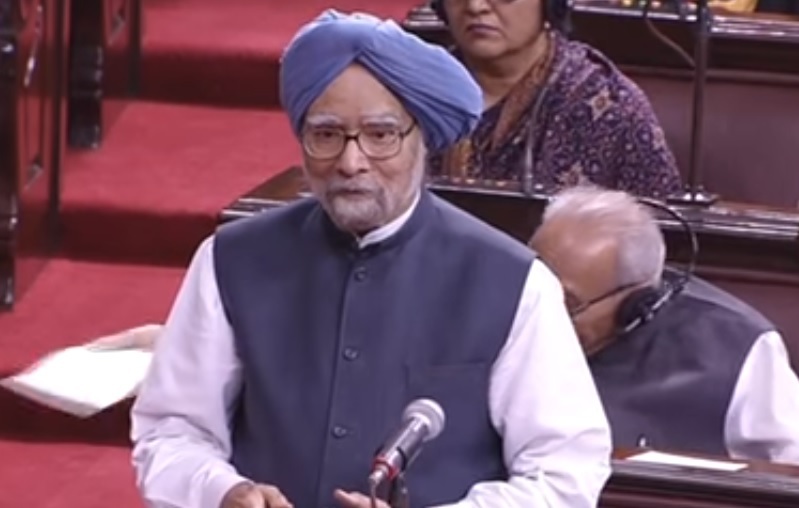 New Delhi: Former Prime Minister Manmohan Singh in a hard-hitting and erudite speech in Rajya Sabha today said that the Demonetisation of high currency notes by the Narandra Modi led Government at the Centre is a case of “organised loot and legalised plunder of the common people”. Singh said that the implementation of the move has been a ‘monumental mismanagement’. When the House resumed session during the post lunch sitting around 3 pm, the Opposition members demanded the Prime Minister’s presence in the House throughout the discussion. After Union minister Mukhtar Abbas Naqvi said that the discussion is not over. Let’s start the discussion. Leader of the House has specified that prime minister will participate in the discussion, the Opposition members stormed into the well of the House. Thereafter the Rajya Sabha was adjourned till 11 am Friday. Soon thereafter, CPM leader Sitaram Yechury told media-persons that a notice has been served for moving a motion of contempt against the PM for not showing up in the House. Prime Minister has been arguing that this is the way to curb black money, to prevent growth of forfeiture currency notes and also to help in control of terrorist finance activities. Therefore, it is important to take note of grievances of the ordinary people who have suffered as a result of this imposition on the country overnight by the Prime Minister. And I say so with all responsibilities, that we do not know what will be the final outcome. Prime Minister has said that we should wait for 50 days. Well 50 days is a short period. But for those who are poor and from the deprived sections of the society even 50 days’ torture can bring about disastrous effects. And that’s why about 60 to 65 people have lost their lives, maybe more. And what has been done can weaken and erode people’s confidence in the currency system and in the banking system. I would like to know from the Prime Minister the name of any country he may think of where people have deposited their money in the banks but they are not allowed to withdraw their money. This alone,I think, is enough to condemn what has been done in the name of greater good of the people of the country. I would further like to point out that in my opinion that the way the scheme has been implemented will hurt agricultural growth in our country, will hurt small industry, will hurt all those people who are in the informal sector of the economy. And my own feeling is that the national income, that is the GDP, can decline by about 2 per cent as a result of what has been done. This is an underestimate, not an overestimate. Therefore, I feel that the Prime Minister must come up with some constructive proposal on how we can implement this scheme and at the same time prevent this distress that has been caused to the common people. Therefore, I would not like to say much more than this. I urge upon the Prime Minister to find practical, pragmatic ways and means to relieve the distress of the people who happen to be a great majority. After all, 90 per cent of our people work in the informal sector, 55 per cent of our workers in agriculture are reeling in distress. The cooperative banking system which serves large number of people in the rural areas is non-functional and has been prevented from handling cash. So, in all these measures convince me that the way this scheme has been implemented is a monumental management failure, and in fact, it is a case of organised loot, legalised plunder of the common people. I thought a ghost was speaking. he was hardly there as was the case when he was PM.